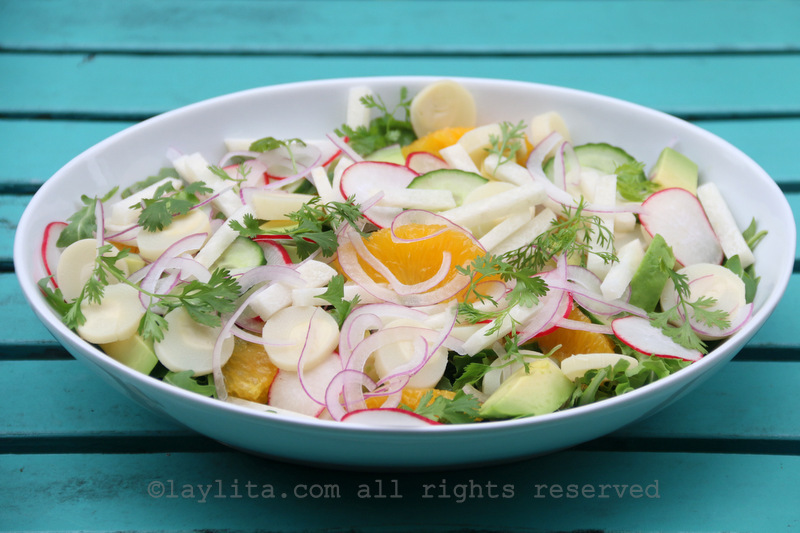 This recipe for a refreshing Latin chopped salad with hearts of palm (or palmito) also has jicama, avocado, orange slices, cucumber, radishes, red onions, and salad greens. 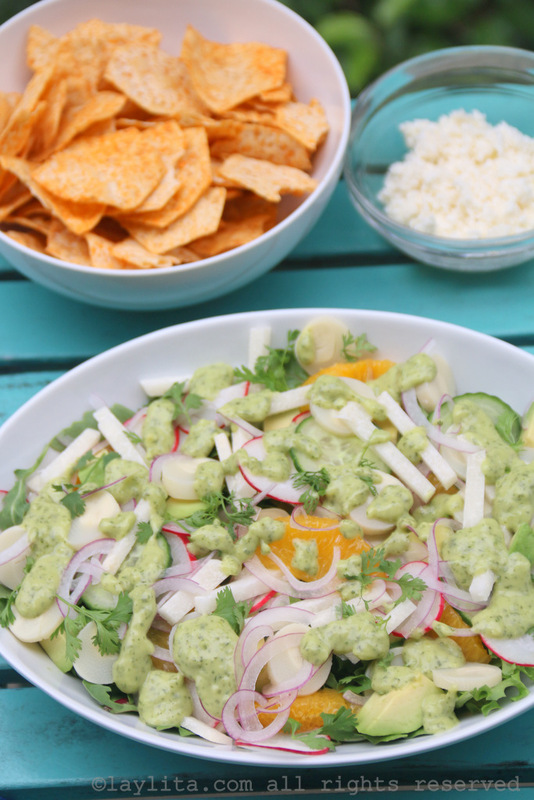 This mixed tropical salad is topped with a creamy avocado cilantro lime dressing, crunchy chips, and crumbled queso fresco. 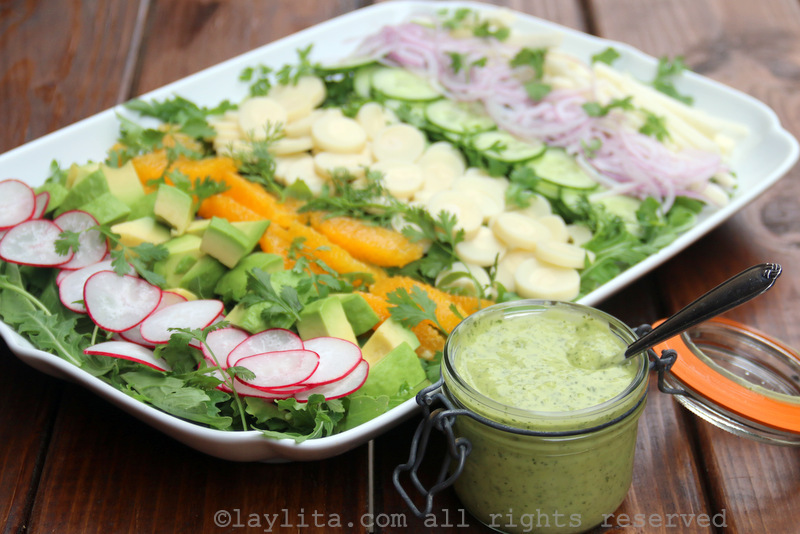 Hearts of palm, called palmitos in Spanish, are a very popular salad component in Latin America. You can find them brined in jars/canned at most grocery stores. 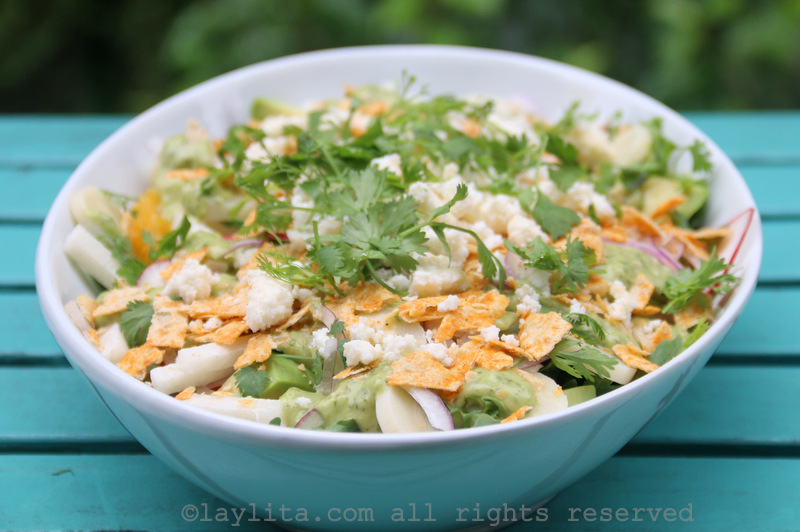 Refreshing Latin chopped salad with hearts of palm (or palmito), jicama, avocado, orange slices, cucumber, radishes, red onions, salad greens.Topped with a creamy avocado cilantro dressing, crunchy chips, and crumbled queso fresco. 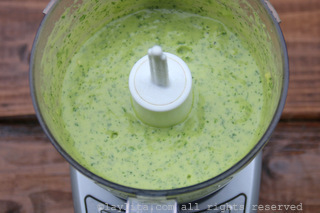 Place all the ingredients for the avocado cilantro dressing in a small food processor or blender and pulse/blend until the ingredients are well combined and you have a smooth sauce. Save refrigerated until ready to use. 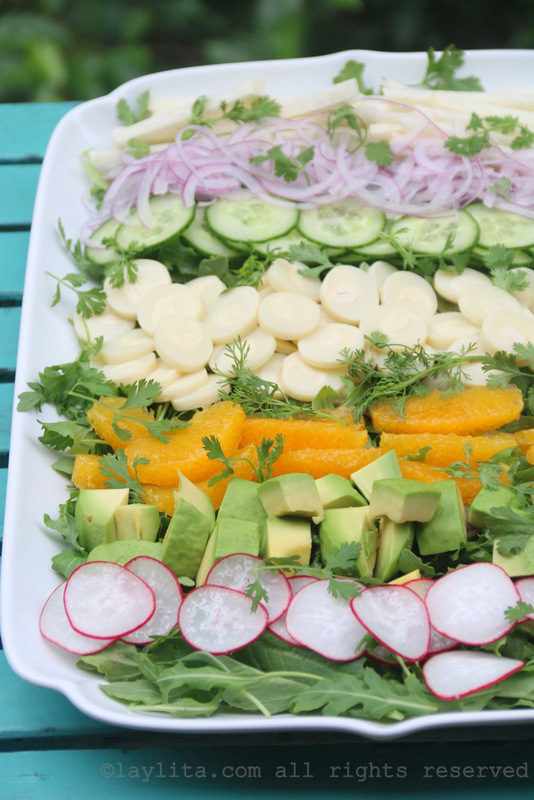 You can assemble the salad on large platter or in a salad bowl. 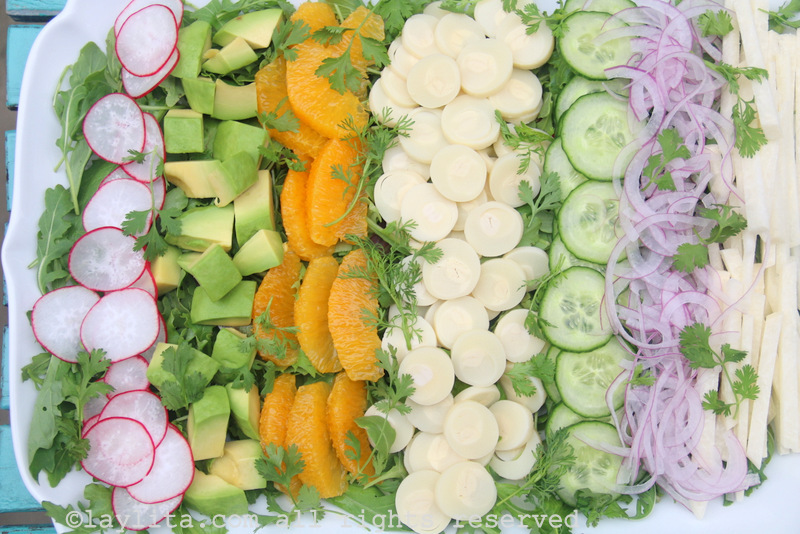 For the platter option, arrange the salad greens as the first layer and then add each vegetable/fruit as if you were setting up a rainbow. 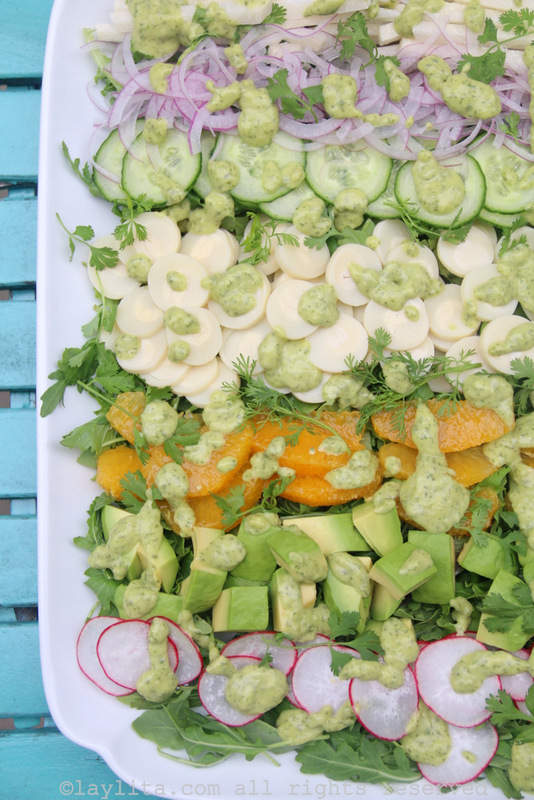 For the bowl option, simply add the sliced veggies and fruits on top of the greens. 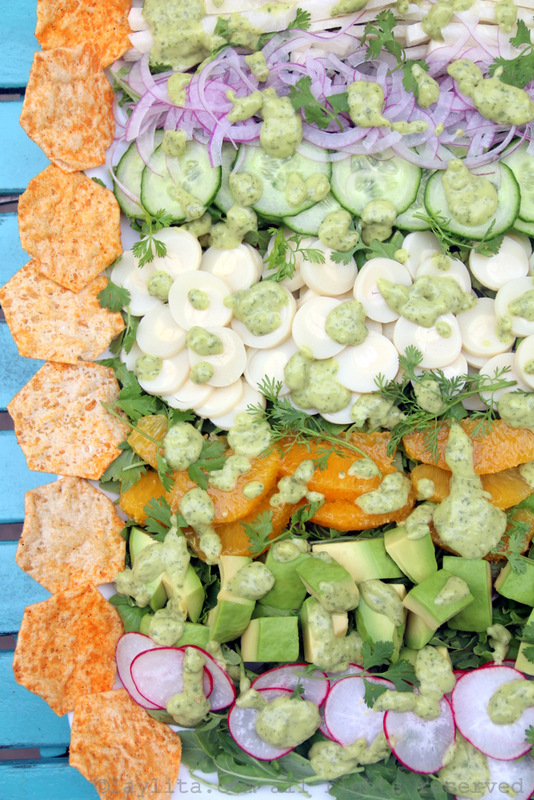 Right before serving, drizzle the salad with the avocado cilantro dressing, add the chips, crumbled queso fresco, and cilantro leaves. 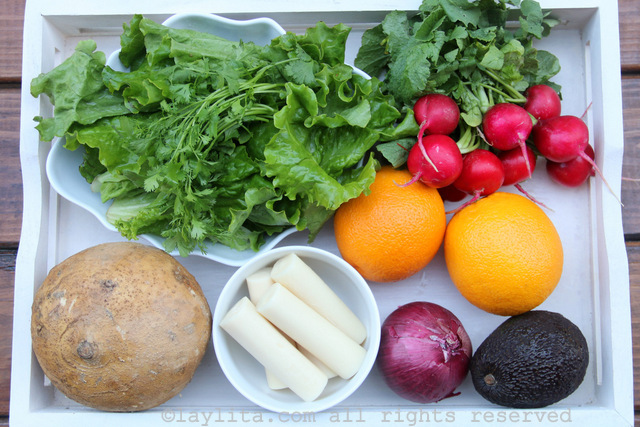 Jicama is a root vegetable that looks like a large turnip, and has a crunchy texture with light sweet flavor. You can find them in the same section as the root vegetables. 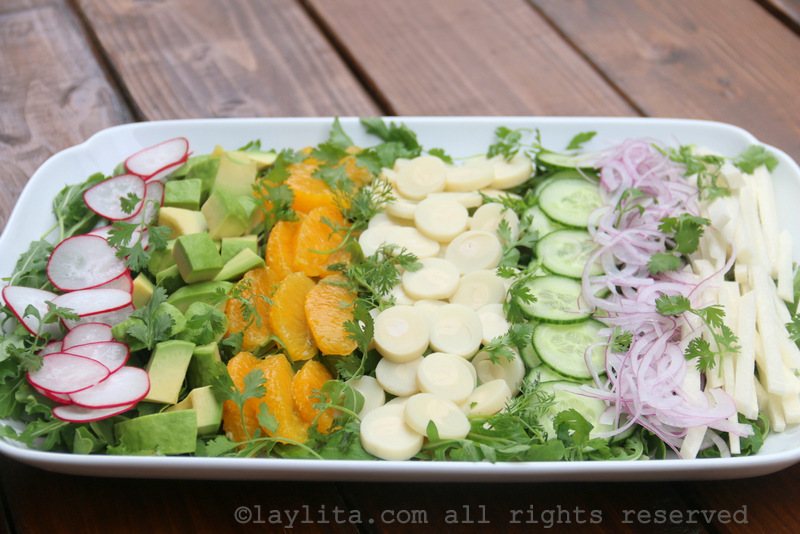 What we know as jicama in Ecuador is juicer and is shaped more like a sweet potato. 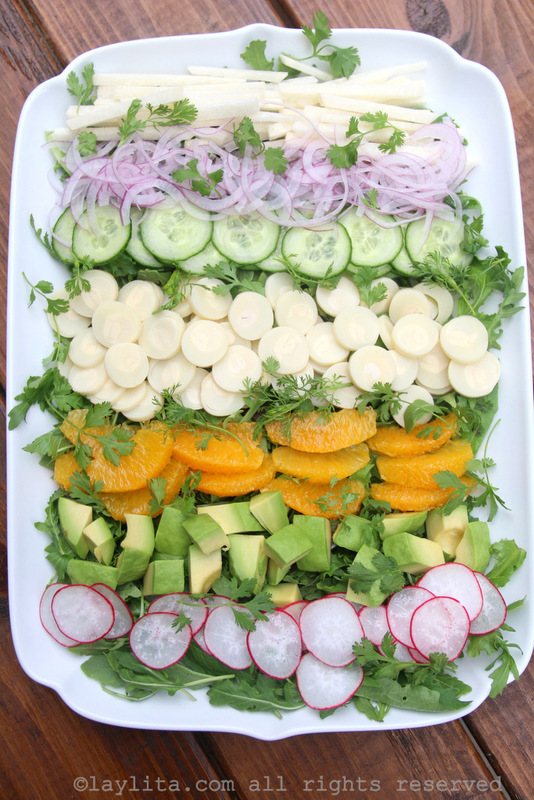 The flesh of Ecuadorian jicama is more of a light orange/cream color. 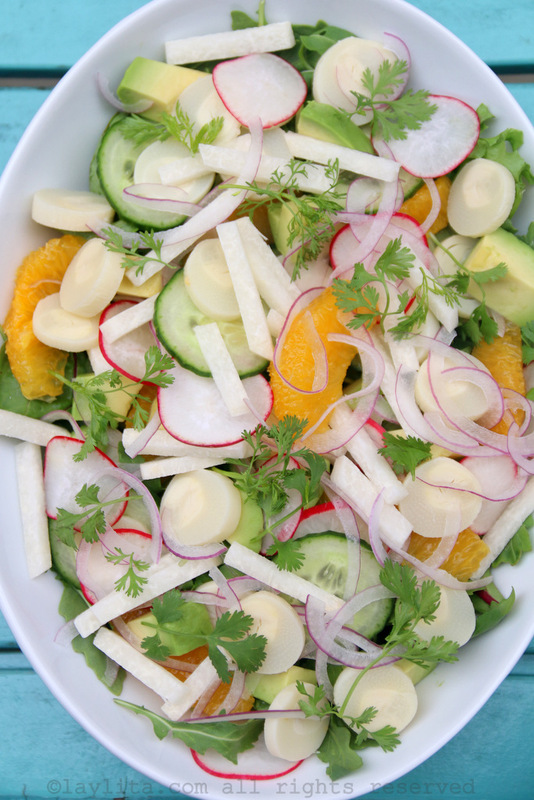 It’s actually a completely different plant than the white fleshed Mexican jicama – but you can use either type for this salad recipe. 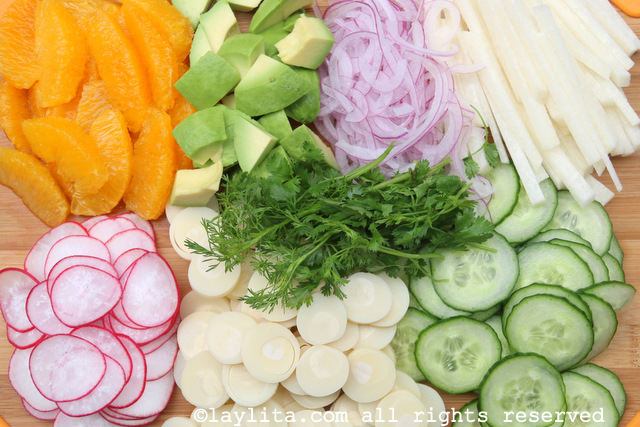 This Latin style chopped salad can be easily customized based on the ingredients that you can find. 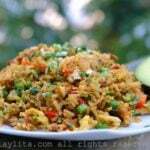 For example, you could also use mango slices or diced papaya instead of the orange. 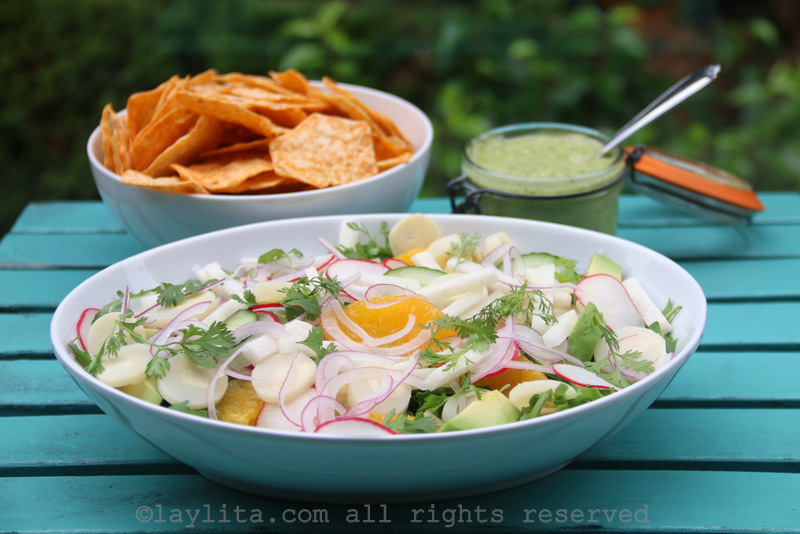 If you can’t find jicama, you could use apple, it will have a similar crunch and sweetness. 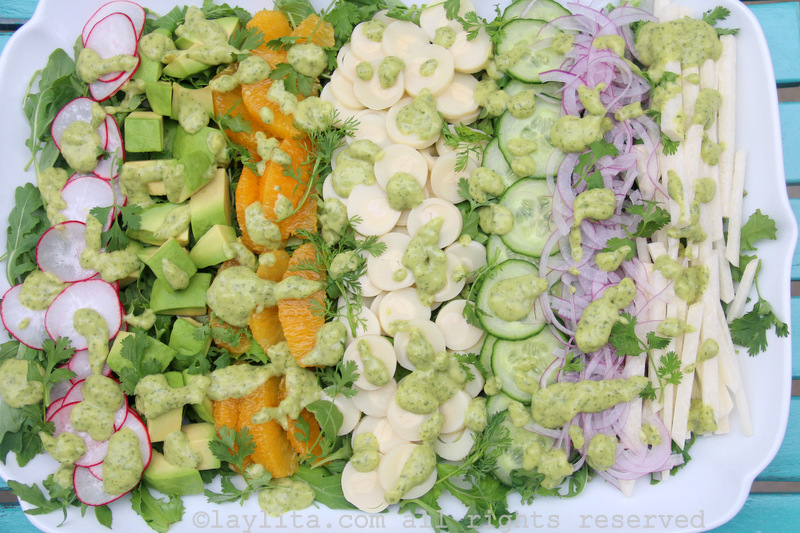 If you want to want to make a heartier more filling salad you could also add some additional protein like grilled shrimp, grilled scallops, leftover chicken, etc. 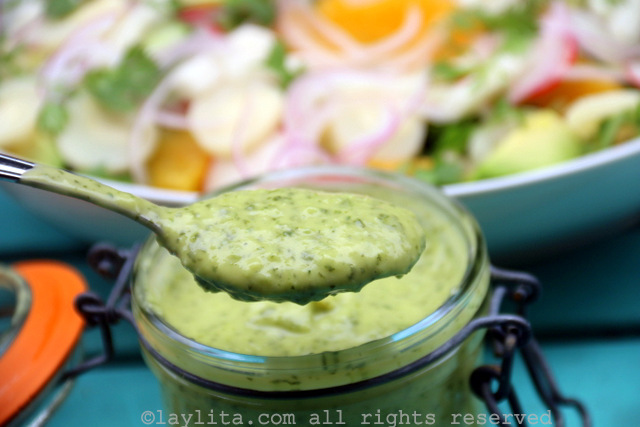 You can also adjust the spice level of the avocado cilantro dressing based on your taste. Typically once you remove the seeds and veins from a jalapeño it becomes very mild and you get the flavor of the pepper without the heat. 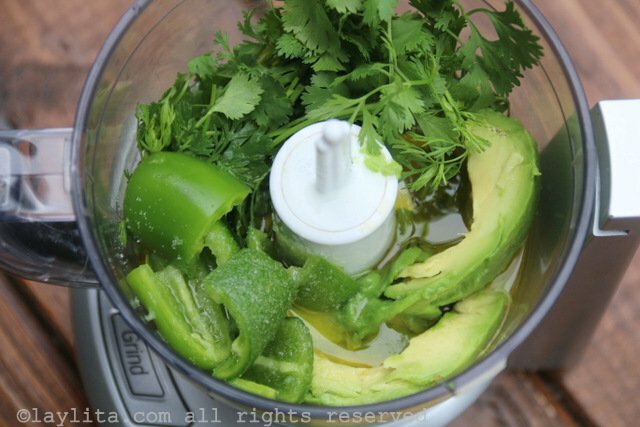 For a version without any heat, you replace the spicy peppers with some diced green bell pepper. 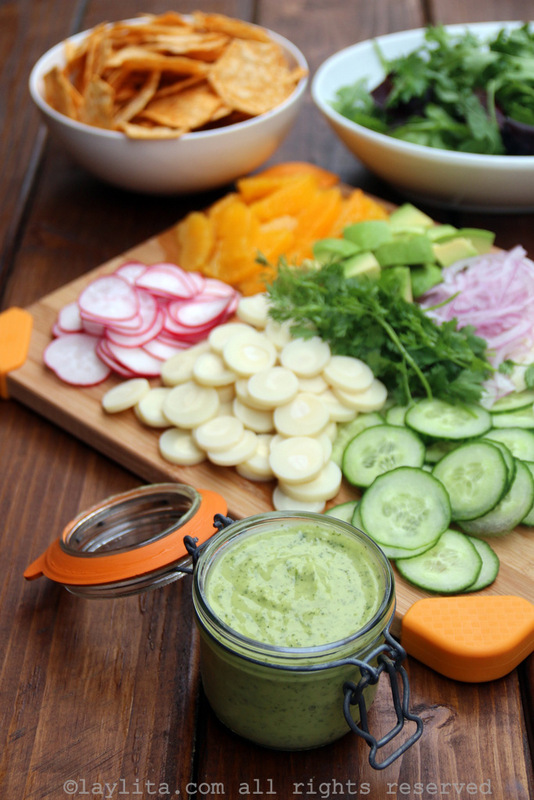 You can also serve some diced or sliced jalapenos on the side for those who would like an extra kick of heat with their salad. I’d rather make jicama chips out of the other half of the jicama than use tortilla chips. I don’t eat corn now that it is defoliated in the field with Roundup before harvest in the US. Jicama chips sound great! I originally made this recipe using multigrain chips from Van’s Foods – and they’re a company that’s committed to the Non-GMO Project. 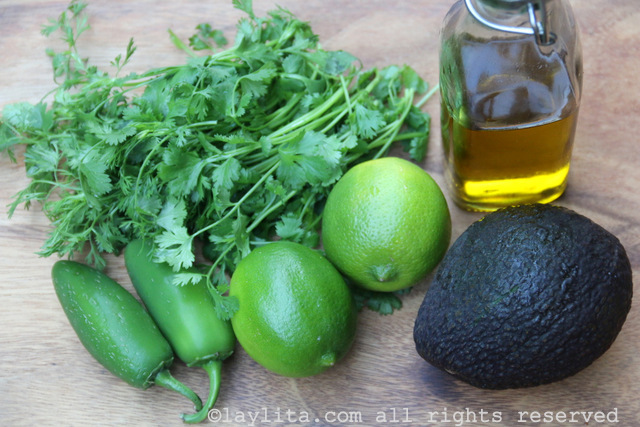 The chips, and all ingredients in this recipe, are easy to customize and change based on your preference. The other problem is corn is so high in starch and that kills my eating plan even if and when corn is not GMO. But everyone has to make this decision for themselves. For me absolutely no corn of any kind and then I don’t have to worry about anything — starch or GMO. 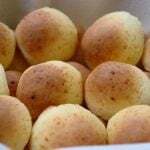 Starch turns to blood sugar in 20-30 minutes and I don’t need that.